How do I make an Import Declaration? How do I make the Aus Post Import Customs Clearance Declaration? 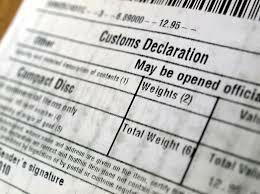 Import declarations are used by importers or licensed customs brokers acting on their behalf to clear imported goods from customs control. Generally all goods imported into Australia are liable for duties and taxes unless an exemption or concession applies. Goods valued at AUD 1000.00 or less are usually exempt from import taxes and should be delivered to you directly by Australia Post. However, duties and taxes will still apply on certain goods (tobacco, tobacco products, alcoholic beverages, etc.) regardless of their value. We recommend first-time or infrequent importers to use the services of a licensed customs broker to clear their goods. If you plan to clear your goods yourself and the goods have a value of more than AUD 1000.00 you will need to make an Import Declaration (N10 Form) and pay the duties, taxes and charges that apply. An Import Declaration is a statement made by the importer (owner of the goods) or their agent (licensed customs broker) to Australian Customs that provides information about the goods being imported. The Import Declaration collects details on the importer, how the goods are being transported, the tariff classification and customs value. This is the notification (or letter) sent to you by Australia Post advising that your purchase has arrived and is being held by customs. Australia Post and Customs will allocate a ‘customs reference number’ specific to the held parcel – this number is on the notification card or can be obtained by calling Australia Post on 13 76 78. This document is your proof of purchase and what you have paid for your consignment. For example, it can be your eBay or PayPal receipt or any other document from the supplier that which list the description and the costs of all your products. Please note that we will require the supplier’s details, so if they are not on the invoice or receipt please ensure to send them through. Once we acknowledge receipt of your documents, we will start working on your import declaration and ensure a swift clearance of your goods.